If you have any questions about your bill or wish to update your insurance, contact us by calling 502-852-5103. No Refunds (Any OVER payments can be addressed). Please Note: Payment process formats best on the Google Chrome Browser. Enter information from your bill in the form below to start the payment process (All Fields Required). Valid Email Address: Please enter a valid Email Address. NO Email Confirmation Sent. Phone Number Please enter the best number at which we may reach you in case of questions. 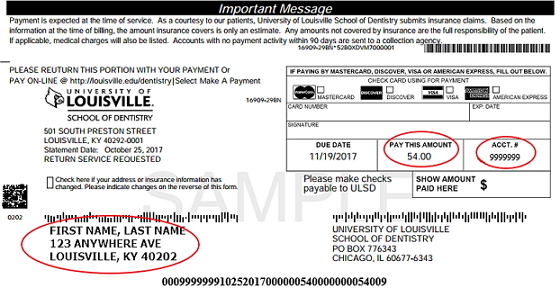 Account Number: Enter account number from your paper bill as shown in the sample image above. No spaces, extra characters. Amount to Pay: Please enter the dollar amount you wish to pay. Use only numbers and decimal point. Please note that as of May 11, 2018, the payment page has changed to allow emailed receipts. After submitting payment on the next page, we encourage you to enter an email address to receive an electronic copy of your payment submission. If an emailed receipt is not desired, please print a confirmation of payment for your records.